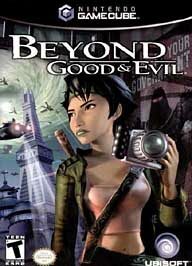 I was particularly proud this week to see that GameSpy.com has awarded cult favourite game Beyond Good and Evil 7th best GameCube Game ever! I worked on BG&E when I was with Ubisoft in 2003 and it is still the best game I have played. Filmmaker Peter Jackson loved the game so much that he sought out the creator Michel Ancel (also the original creator of Rayman) to make the King Kong videogame of his new highly anticipated movie, due out at the end of this year. There is something very cinematic about Ancel's work - he's able to truly tell a story and keep you immersed with both the characters and the design. You can still buy BG&E at GameStop.com and EBGames.com and Amazon.com.